Further to our initial conservation work in 2014 on eight of the PCWW (Plymouth Corporation Waterworks) boundstones, we have now had another very successful day on which seven more stones were conserved, with thanks again to the very generous support of Graham Colton. For the original write-up on this initiative please see this news article. 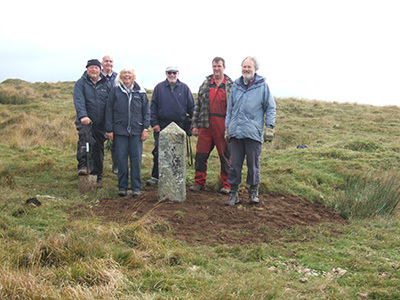 On 16 October 2015 six Dartmoor Society volunteers (Tom and Elisabeth Greeves, Tanya and Barry Welch who brought along some of their tools, Barrie Quilliam, and Simon Booty who also supplied tools as well as the use of his Land Rover and Dumper truck), all met at the start of the track to Nuns Cross Farm. Graham Colton’s driver Mark Cole also attended with a tractor and trailer, and his help was truly invaluable. Warm thanks must also go to Justine and David Colton who very kindly provided use of another tractor and front loader. Weather conditions were perfect and the ground was uncharacteristically dry. We all headed past Nuns Cross Farm to the south-western slope of Eylesbarrow, to work on two of the remotest PCWW boundstones. 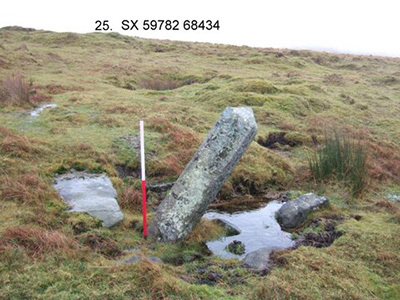 We then moved to the Forest of Dartmoor boundary between Eylesbarrow and Nuns Cross and were able to conserve another four PCWW stones as well as an unmarked Forest of Dartmoor boundary stone. Two of the stones were recumbent and took extra effort to re-erect. All the stones had hollows around their bases which required filling with soil, and some had rushes growing against them, which needed trimming. 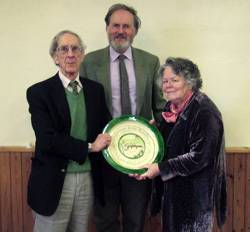 The Dartmoor Society is most grateful to have received from the Maristow Estate a letter dated 15 October 2015 and a generous donation in the form of a cheque for £500 ‘In recognition of the conservation work your organisation carries out on the Commons of Dartmoor’, in the hope that it ‘will help towards future projects’. A further day of work is being planned for 2016. We are pleased to announce that the Member Centre on our website is live. Members can now sign in securely to update their contact details and book events online. For security we have given each member an automatically generated password not known to anyone. The first time you use the Member Centre simply enter your email address and click the Email Password button to receive your initial password. It can be changed to something more memorable after you have signed in. To get started go to the sign-in page and follow the instructions. 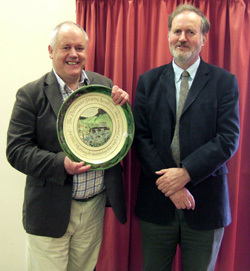 The 13th Dartmoor Society Award was presented by Chairman Dr Tom Greeves at the Society’s Annual General Meeting held at Manaton on 17th April. 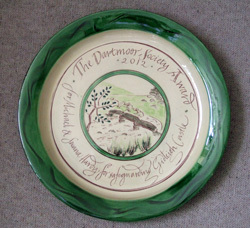 The Award is made annually to individuals or groups who, in the opinion of the Society, have made a special contribution to Dartmoor. 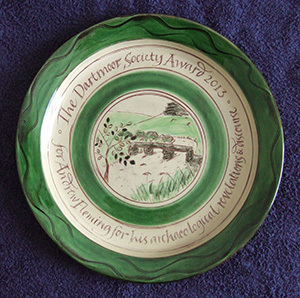 The Award is in the form of a ceramic plate uniquely crafted by potter Penny Simpson of Moretonhampstead and calligrapher Susanne Haines of Bovey Tracey. 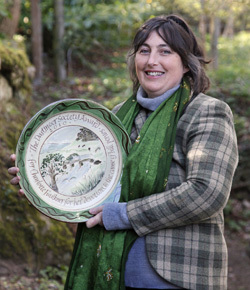 Charlotte Faulkner’s plate is inscribed with the words ‘The Dartmoor Society Award 2010 – for Charlotte Faulkner for her devotion to the cause of hill ponies’. Charlotte has for more than ten years spearheaded a campaign to give the traditional hill ponies of Dartmoor the recognition they deserve for their importance to the grazing management of the moor, and their wonderful qualities as riding pets, so that they obtain fair prices at the annual pony sales. 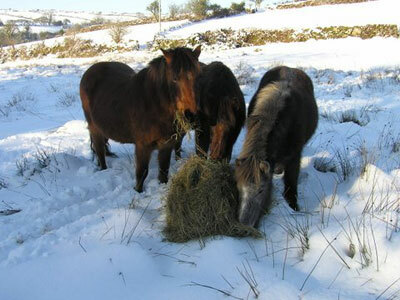 She established the Dartmoor Hill Pony Association, and the Friends of the Dartmoor Hill Pony, from her Dartmoor farm base. She and her ponies are well-known at Devon County Show, and each year she also organises the fundraising 50-mile Dartmoor Challenge. Members with long memories will recall that, following a detailed suggestion by committee member and farmer Miles Fursdon, in 2005 the Society initiated meetings with county council engineers, DNPA archaeologist, and the parish councils of Holne and Widecombe-in-the-Moor to make very small adjustments to the parapet of medieval New Bridge (listed Grade II*) which crosses the R. Dart, in order to reduce the damage done by collisions, and to avoid costs and the resulting considerable inconvenience to local people when the bridge was closed for repairs. Newsletter 24 (October 2005) pp.3–6 gives a full report. All parties seemed interested and supportive of the proposals. Since 2005, despite reminders from the Society, there has been very little activity on behalf of the county council, but in 2008 they seemed keen to move things forward and carry out the necessary work. We have now received a letter dated 8 January 2009 from the Dept of Environment, Economy & Culture, Devon County Council, to let us know that English Heritage do not support alterations to the bridge. The English Heritage view is that “...we should adapt to the bridge, not the other way about. The Moor is special and all agree that it imposes constraints...what you propose, though ingenious, has no guarantee of being a long-term solution. Importantly, it is our view that what is proposed would damage the design and affect the character of the grade II* bridge, besides being the continuation of ‘death by a thousand cuts’. There is no need for such damaging change; however slight, it is incremental. Earlier widening should not be seen as a reason for continued widening. This is a traditional, well-built, much-loved bridge in a particularly picturesque setting; a renowned beauty spot on the Moor...We appreciate that you have given the matter considerable thought and attention and recommend that this is extended to an objective appraisal of non-destructive options, including better signage and fore-warning of the restrictions; tightening of the restrictions and physical restrictions...”. This is a very disappointing and somewhat patronising response, and much of what English Heritage states is open to question. The county council says it will now look at improved signing as the only option. 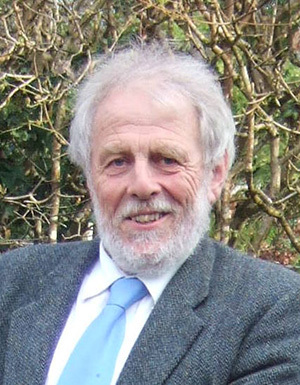 A formal response by The Dartmoor Society will be considered. Those who attended our Debate on What Future for Dartmoor’s Water Resources? last September will recall that Simon Bates of Natural England mentioned a ‘pilot’ project on the Rattlebrook (an ‘instant success’) at SX 561870 for rewetting the blanket bog by building timber dams in old peat-cutting channels. This met with some scepticism, especially from your Chairman (see p.33 of Newsletter 33, October 2008). Since then, Natural England, Dartmoor National Park Authority and the Duchy of Cornwall have pressed ahead with a much bigger scheme on the newly named ‘Blackabrook Down’, a substantial hill N of Black Dunghill, between the rivers Walkham and Cowsic, at SX 583782. Here some 200 timber and turf dams have been set in old peat-cutting drainage channels and another 400 dams are proposed. 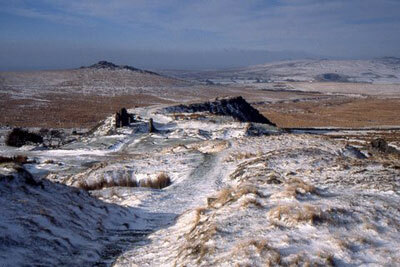 An equivalent scale of operation is planned for Flat Tor Pan (between the West and East Dart rivers) at SX 612811, and on Winney’s Down (SX 625820), with a smaller area on Hangingstone Hill (SX 617857). Astonishingly, the Blackabrook work has been done without any consultation with commoners who are charged to manage the grazing under the Dartmoor Commons Act 1985. Hill farmers have questioned the legality of the work, as they see their ‘lears’ (traditional grazing areas) have been disrupted, as well as access routes for stock. They are also concerned that calves and sheep might fall into the new ponds. Walking will undoubtedly become more difficult too. 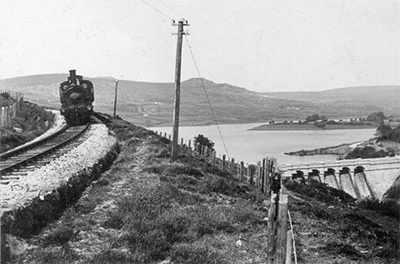 Tracks are being created by the machinery being used. The words used and the aims sound plausible but The Dartmoor Society has every reason to be concerned about this work – in the 1990s the same bodies assured us that Dartmoor was overgrazed and needed a 50% reduction in grazing animals. The result has been a vigorous growth in vegetation (especially gorse and coarse grass) which is causing very serious problems for hill farmers, walkers and those who wish to study and explore archaeological features. The present claim by Natural England that the blanket bog (12,000 ha) of Dartmoor needs ‘restoration’ is hardly proven – criteria borrowed from northern English moors have little relevance to Dartmoor where plant species and conditions are different. Natural England also seems remarkably antagonistic towards traditional swaling (burning of moorland vegetation. A likely prehistoric barrow cemetery on Blackabrook Down does not seem to have been recognised and the old peat workings, which are archaeological features in their own right, are being compromised by the dams. There is no significant erosion of peat here or elsewhere on Dartmoor (except where turves have been dug to make dams!). The project seems more driven by the availability of funds (several hundred thousand pounds of public money to be spent within a short timescale), and fashionable vocabulary, rather than any rigorous analysis of the situation. 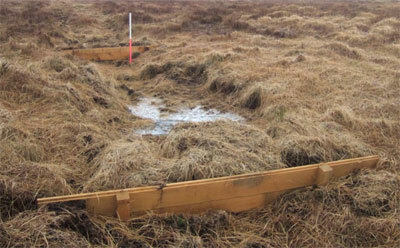 However, some good things are riding on the back of the project – Dr Ralph Fyfe of the University of Plymouth (who gave our Research Lecture in 2007) is doing some very important work measuring the depth of peat and dating its formation, but no preliminary work seems to have been done on the way in which peat retains water. A handful of ‘dipwells’ are being introduced to monitor changes in the water table. Perhaps most disconcerting is that the external experts seem to have little understanding of the historic management of Dartmoor nor, more specifically, understanding of the ancient peat industry of the moor, and yet they are hell-bent on interference. The project seems to have gone well beyond a ‘pilot’ phase without rigorous debate, despite the project brief stating that “Restoration will be planned and undertaken with full consultation of all relevant organisations and individuals”. The project unfortunately reflects the inappropriate dominance of Natural England without a properly balanced approach, which should take into account the long cultural history of Dartmoor. Hill farmers are facing enormous difficulties thanks to the flawed decisions of the 1990s. This project will do nothing to reassure them, though no doubt they will be offered money as compensation which, attractive to some, is insulting and demeaning to others, and will still not resolve grazing issues. Since the mid-1950s there has been ‘permissive’ access for vehicles along some 5km of tarmac road which comprises the military Loop Road, or Ring Road as it is sometimes known. The southernmost point of the road is at Observation Post 15 OP15 which is only 2km from Cranmere Pool. Since the 1980s a policy of ‘benign neglect’ has been applied to the road, resulting in repairs only necessary for the military to continue use of the road for training purposes. The road is now in places in a very poor condition, and potentially dangerous for private cars. The Duchy of Cornwall, the landowners, have now proposed that most of the road should be closed to civilian vehicles. Civilian access on tarmac would be allowed only as far as OP22 (Harter Tor) where there would be a barrier and turning area. Car parks at SX 596923, 600920 and 598921 would be improved. The Moor Brook road that leads to a point (SX 591913) between West Mill Tor and Rowtor would be maintained with permissive access for civilian vehicles. DNPA considered these proposals on 9 January and decided to support the Duchy of Cornwall in principle, with details concerning car parks etc to be decided. At a meeting of the Executive Committee of The Dartmoor Society on 30 January all members present felt that the Duchy proposal should be supported in principle as it would bring environmental benefits in the widest sense to this part of wild Dartmoor. However, it is recognised that this view is not shared by all our members. In September 2007 The Dartmoor Society wrote to Dartmoor National Park Authority to object to a proposal (Application 0452/07) by Airwave O2 to place a telecommunications (Tetra) mast beside the Church Way on the east flank of Hameldown above Widecombe-in-the-Moor. 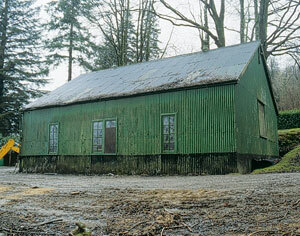 Widecombe parish council objected strongly to the plan. Our objection focused on the historical significance of the Church Way which was the route by which the inhabitants of the ancient tenements of central Dartmoor travelled to and from Widecombe church. Although technically in the parish of Lydford, they petitioned the Bishop of Exeter in AD 1260 and were given a dispensation to attend Widecombe church instead (for all services including baptism, marriage and burial). So we can be confident that the route was well used at least since the mid-13th century. A member of the DNPA drew particular attention to our evidence and this influenced the decision of the DNPA to refuse the application which it was deemed “would have an adverse visual impact on the character, appearance and cultural heritage of this part of Dartmoor National Park”. Airwave appealed against refusal and in 2008 a public inquiry was held. At very short notice the appellants sent in 135 pages of new submissions. At this point, much to everyone’s surprise, DNPA, instead of requesting an adjournment, said they were withdrawing from the inquiry. The Inspector decided that an adjournment was appropriate and the second phase of the inquiry was held in January 2009. At the reopened inquiry the Inspector was ‘perplexed’ when DNPA announced that, after all, they were supporting their evidence. However, in the event, DNPA withdrew, leaving only members of the public to fight the cause. We await the Inspector’s decision and report in due course. 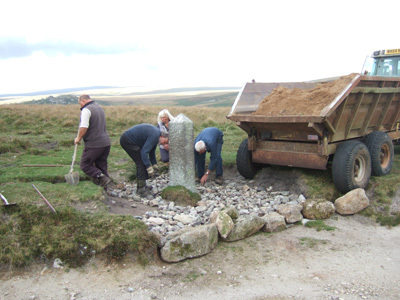 “Since our inception we have expressed concern about the ‘democratic deficit’ of Dartmoor National Park Authority, and are aware of widespread dissatisfaction with the current system [see, for example, Appendix A p.25 in Rural South Devon and Dartmoor Unitary Authority – Putting Our Rural Communities First (South Hams District Council and West Devon Borough Council, 11 April 2008)]. We believe it is unacceptable in 2009 that the eligible electorate of 33,500 residents of Dartmoor National Park are not able to go to a polling booth and vote for a candidate who is putting himself or herself forward to represent them on the National Park Authority. We consider this a ‘black hole’ in the English system of democracy and quite intolerable, given the importance to the local community of the decisions (especially regarding development control) made by the national park authority. We therefore strongly support the principle of direct elections to national park authorities. We believe that all members, other than Secretary of State appointees, should be directly elected. These elections should include the present parish council members. We feel that the national park authority should remain at approximately its present size, but would not object to a small increase in numbers of members. We feel that direct elections would give a legitimacy to, and ‘ownership’ of, the decision-making process which is not felt by the wider community at the moment.